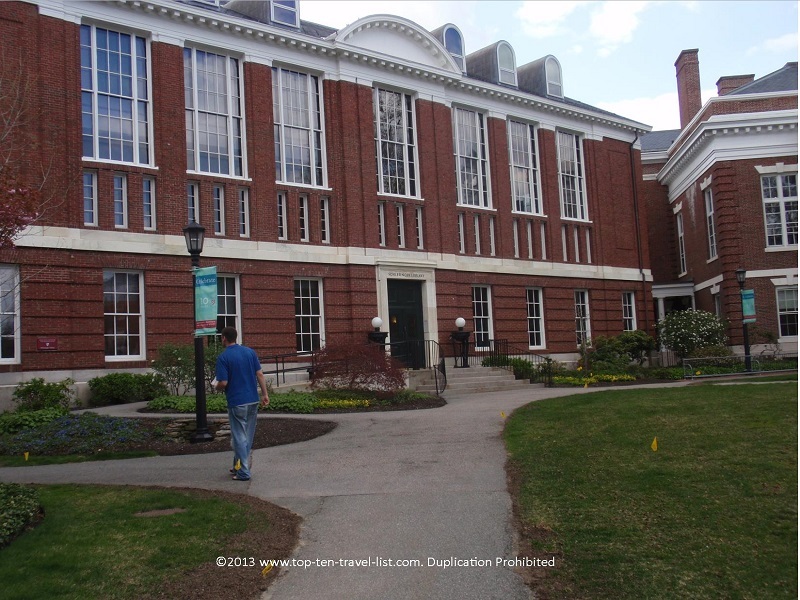 Attraction of the Week: Harvard University in Cambridge, MA - Top Ten Travel Blog | Our experiences traveling throughout the US. 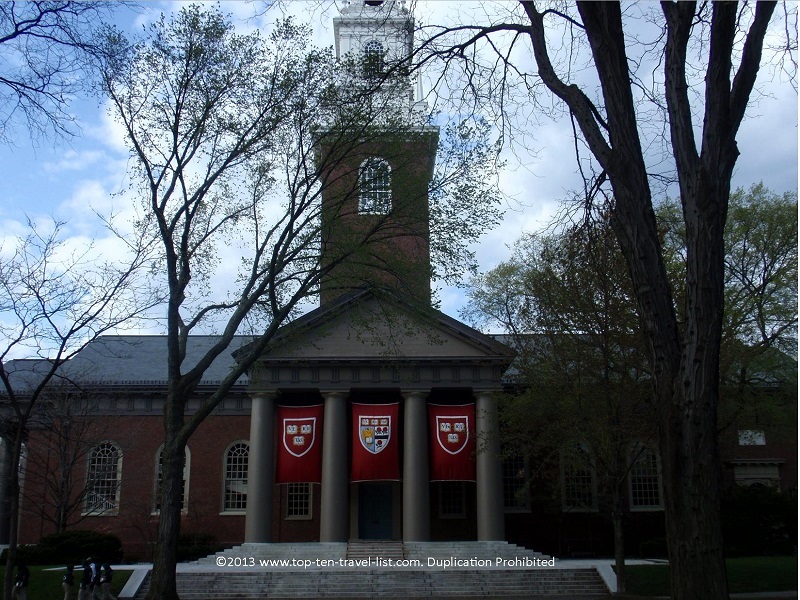 Harvard University, established in 1636, is the oldest institution of higher learning in the United States. This private Ivy League school is located in Cambridge, just a few miles north of Boston. It was named after the first benefactor, John Harvard. In front of University Hall, you will find a bronze statue of John Harvard. Tourists rub his left foot as it is supposed to bring them luck (this is why the foot is still shiny compared to the rest of the statue). We learned on our tour that this statue is known as the “Statue of 3 lies.” The inscription on the statue reads: John Harvard – Founder – 1638. However, everything inscribed on the statue is false for the following reasons: #1. The statue does not represent John Harvard. When the statue was built, no pictures of Mr. Harvard could be found, so a random model was used by the sculptor. #2. John Harvard was not the founder of the school, but rather the benefactor. #3. Harvard was founded in 1636, not 1638! 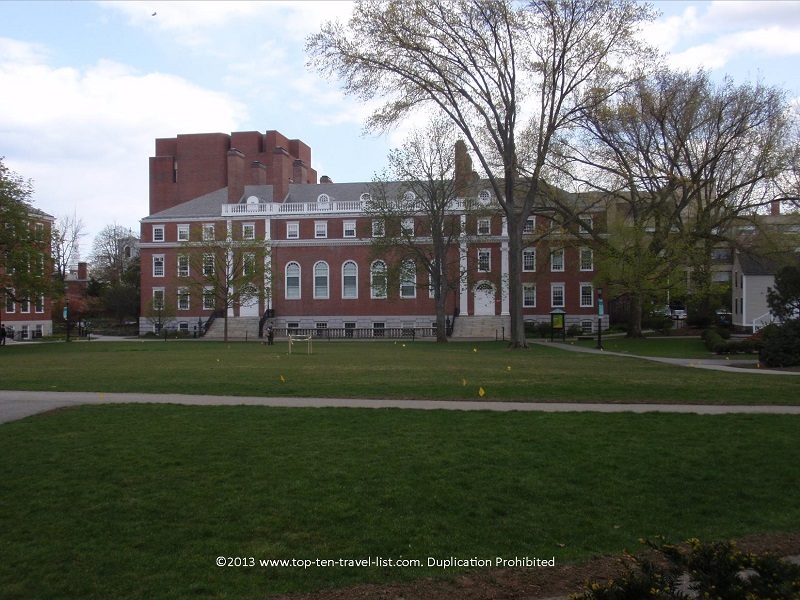 The 1 hour tour strolls through Harvard Yard, a 209 acre area home to most of the University offices, academic buildings and dorms. One of the most notable features in the area is Widener Library, which is the 3rd largest in the country. The unique aspect of this building is that 4 of the library’s 10 floors are built underground. Harry Elkins Widener, whom the library is named after, was a Harvard graduate who died aboard the Titanic in the early 1900’s. His mother donated several million dollars, however, with a stipulation that the library was never to be altered (thus, why it was expanded underground). Memorial Hall, built in 1878, is another notable building in this section of campus. There are 3 divisions in this building: Annenburg Hall, Sanders Theater, and Memorial Transept. Below is a picture (although a bit dark) of the stained glass windows of the Memorial Transept. The white plaques on the side acknowledge Harvard students who died fighting for the Union. Annenburg Hall is closed to the public, although were were able to peek in through the windows. 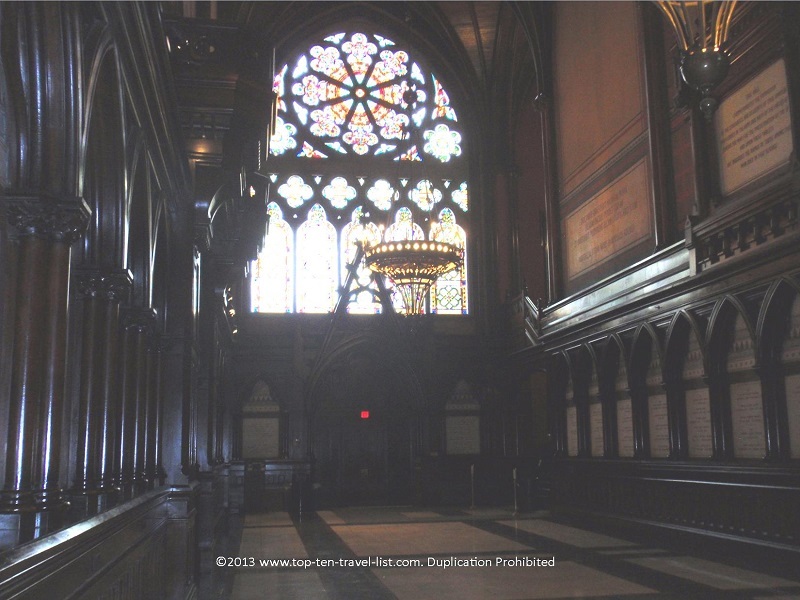 This grand room is now used as a freshmen dining area (it looks similar to Hogwarts dining hall from Harry Potter!). The Harvard Memorial Church was built in 1932 as a dedication to Harvard students and alumni who lost their lives in World War I.
Schlesinger Library is a research library at the Radcliffe Institute for Advanced Study. Established in 1943, the library still exists today to document women’s lives. It is named after History Professor, Arthur M. Schlesinger and his feminist wife, Elizabeth Schlesigner. 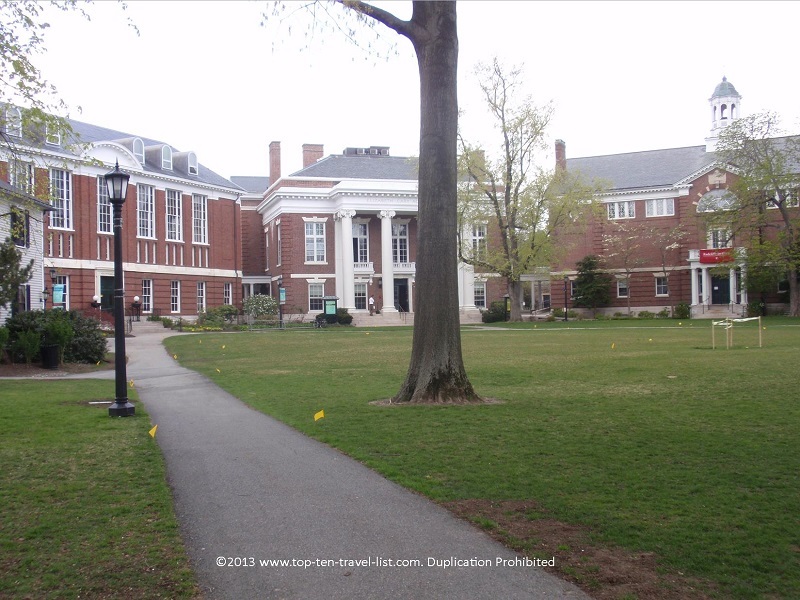 The Radcliffe Institute for Advanced Study (In October of 1999 Radcliffe College (a former women’s liberal arts college) and Harvard University officially merged) is where individuals pursue advanced education. Elizabeth Cary Agassiz was President of Radcliffe College from 1882-1903. 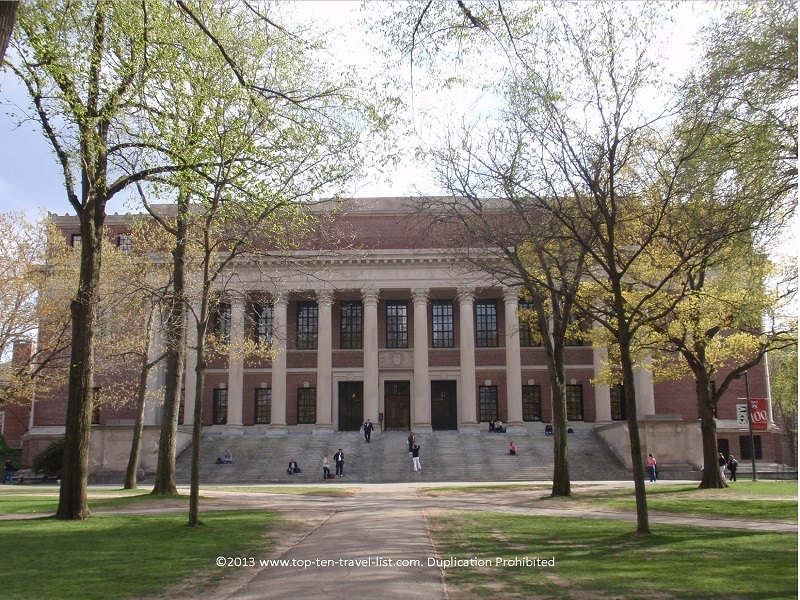 Harvard University is one of the nation’s most prestigious colleges. According to the Harvard University website admission statistics, out of 35,023 students only 2047 were admitted, yielding an acceptance rate of under 5% (Class of 2017 data). 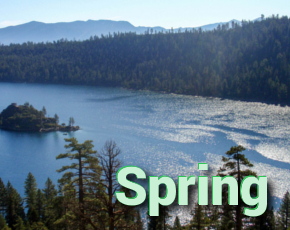 It is also perhaps the most beautiful college campus in the nation. 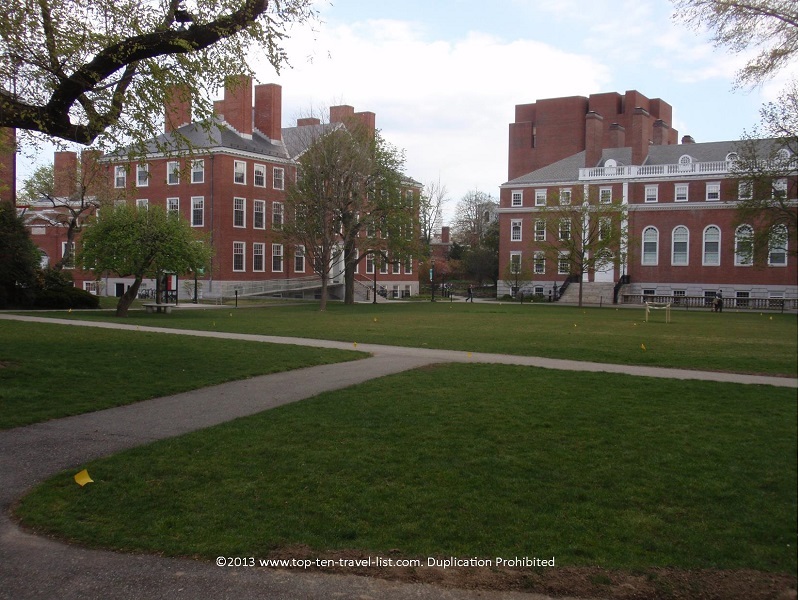 Check out a few more pictures from Harvard Yard, the oldest section of campus. Walking around looking at the historic architecture is incredible. I can imagine leaving after 4 years would be difficult! 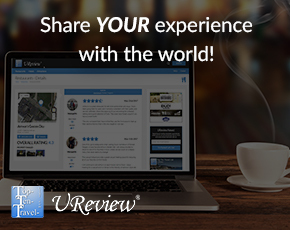 Free guided tours are available for tourists, locals, and prospective students. A current student will take you through Harvard Yard while giving you a brief history of the important landmarks. Be prepared for an hour walk. Tours meet at the Harvard Information Center (1350 Massachusetts Ave, Cambridge, MA 02138), in the Smith Campus Center. Arrive at least 30 minutes ahead of time as tours are capped at 35 people. 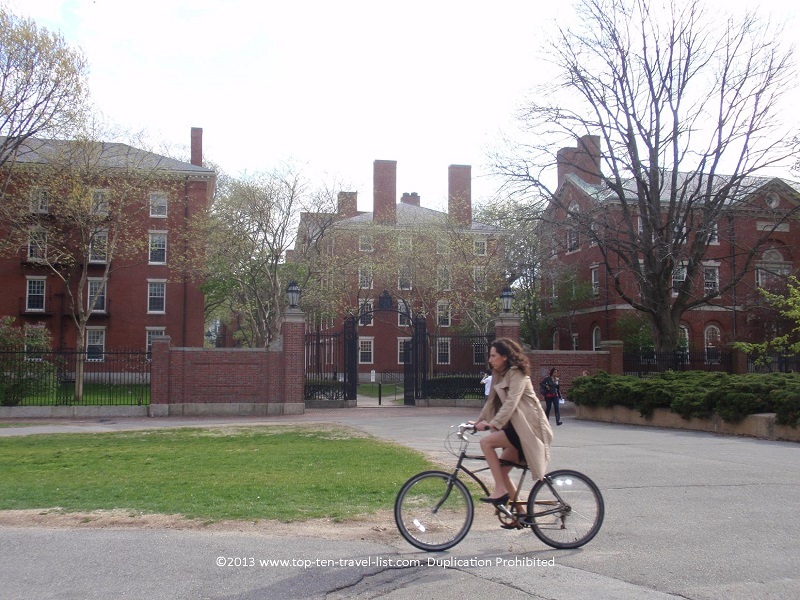 View the Harvard Tour Calendar to plan an appropriate time. *Harvard does not allow any filming on its’ campus. Most movies said to take place at the University are actually filmed elsewhere (i.e. Legally Blonde and The Social Network). * A handful of movies have filmed at Harvard Square (where filming is allowed), including: Good Will Hunting, The Town, and Just Cause. *President Obama was the 8th President to graduate from the University (he is a 1991 graduate of Harvard Law School). *Plenty of celebrities are graduates, including Natalie Portman, Conan O’Brien, and Tommy Lee Jones.